Background Members of two seemingly unrelated kindreds of Arab Moslem origin presented with pronounced early onset spastic paraparesis of upper and lower limbs, mild intellectual disability, kyphosis, pectus carinatum and hypertrichosis. Methods The authors performed neurological and developmental examinations on the affected individuals. The authors conducted whole genome linkage and haplotype analyses, followed by sequencing of candidate genes; RNA and protein expression studies; and finally proof of principle investigations on knockdown morpholino oligonucleotide injected zebrafish. Results The authors characterise a novel form of autosomal recessive complex hereditary spastic paraparesis (CHSP). MRI studies of brain and spinal cord were normal. Within a single significantly linked locus the authors ultimately identified a homozygous missense mutation c.1146A>T (p.K382N) in the vacuolar protein sorting 37A (Vps37A) gene, fully penetrant and segregating with the disease in both families. Mobility was significantly reduced in Vps37A knockdown morpholino oligonucleotide injected zebrafish, supporting the causal relationship between mutations in this gene and the phenotype described in the patients of this study. Conclusions The authors provide evidence for the involvement of Vps37A, a member of the endosomal sorting complex required for transport (ESCRT) system, in upper motor neuron disease. The ESCRT system has been shown to play a central role in intracellular trafficking, in the maturation of multivesicular bodies and the sorting of ubiquitinated membrane proteins into internal luminal vesicles. Further investigation of mechanisms by which dysfunction of this gene causes CHSP will contribute to the understanding of intracellular trafficking of vesicles by the ESCRT machinery and its relevance to CHSP. We present two Arab Moslem consanguineous kindreds with multiple affected individuals presenting a unique phenotype of CHSP. We determined the causative mutation in the gene vacuolar protein sorting 37A (Vps37A), encoding for a subunit of the ESCRT-I complex. The ethics committee of Western Galilee Hospital, Nahariya, and the supreme Helsinki committee of the Israeli Ministry of Health approved the study. All study participants and parents of minors signed informed consent. Complete physical, neurological and developmental examinations were performed on available and consenting individuals with CHSP from the two kindreds. Family history, laboratory test results, metabolic measurements, operations and medical procedures, including brain MRI, EEG, EMG, and muscle biopsy were accessed. To localise the mutated gene we performed linkage analysis using a genome-wide scan with 2000 microsatellite markers distributed throughout the genome, at average intervals of 2 cM (DeCode, Iceland), as previously described.10 Additional markers on suspected regions were selected from the UCSC Human (Homo sapiens) Genome Browser Gateway and the ‘Linkage Mapping Set v2.5 MD5 and MD10’ kits (Applied Biosystems, Carlsbad, California, USA). Data were analysed using the Superlink Online software11 under an autosomal recessive mode of inheritance, with 99% penetrance and a disease allele frequency of 0.001, assuming uniform allele frequency distribution. Genes involved in the development and differentiation of neurons and dendritic cells, in particular paroxysmal axons of the motor and sensory systems. Coding regions and at least 50 bp of flanking intron regions of eight genes, encompassing the top candidate genes in the linked interval, were sequenced and analysed using the ABI Prism 3100 automated sequencer according to the manufacturers' standard protocol (Applied Biosystems) and nucleotide blast (NCBI). Known single nucleotide polymorphisms (SNPs) with no link to the pathology were filtered. Recently, two mutations in KIF1A were reported to cause pure HSP, one of them in Palestinians.12 ,13 We have sequenced exon 8 and exon 13 of this gene, as it is located on the tip of chromosome 2 and might have generated a negative logarithm of odds (LOD) score due to the lack of markers next to it. The mutation's impact was assessed using Polyphen (Harvard), PANTHER (USC) and SIFT (JCVI) databases, PredictProtein package and the 1000 Genome Project and NCBI's dbSNP databases were examined to make sure a mutation in this position was not reported before. A structure of VPS37A was deduced by homology to the saccharomyces cerevisiae orthologue of VPS37A (RCSB PDB 2p22_C), and the impact of the K>A mutation was analysed using Chimera software (UCSF). The mutation's impact on protein stability was analysed with MUpro (UCI) tool. The presence of Vps37A c.1146A>T mutation was tested in all participating members of both kindreds, in 50 healthy controls from the same village and in 214 ethnically matched healthy controls (Arab Muslims, residents of the northern region of Israel), via restriction analysis with Hinf1. Genomic DNA was amplified by PCR, using primers flanking Vps37A exon 11: 5′-ATTTTCTAGATTTGCCACTG-3′ forward primer and 5′-TTCTACATTAGCAGCTAATG-3′ reverse primer, followed by enzymatic digestion with Hinf1 (New England Biolabs, Ipswich, Massachusetts, USA). PCR products were separated on 8% acryl amid gel. The wild type allele presents two bands of 230 bp and 111 bp; and the mutated, three bands of 230 bp, 72 bp and 39 bp. We examined the nature of Vps37A expression in different tissues from both healthy and affected individuals. Vps37A mRNA transcript (Human Multiple Tissue cDNA Panel, BD Biosciences, San Jose, California, USA) was studied in eight normal tissue types: heart, brain, placenta, lung, liver, skeletal muscle, kidney and pancreas. To compare the level of transcription of Vps37A in patients and healthy controls, we purified total RNA from whole peripheral blood using the RiboPure-Blood Kit (Ambion, Life Technologies, Carlsbad, California, USA), and extracted total RNA from fibroblasts using GenElute Mammalian Total RNA Miniprep Kit (Sigma-Aldrich, St. Louis, Missouri, USA). RNA samples were reverse transcribed to cDNA and PCR amplified to detect Vps37A and β-actin. PCR conditions for Vps37A and β-actin were 30 s at 94°C, 30 s at 55°C and 10 s at 72°C for 34 cycles. Primer sequences for Vps37A were: 5′-CACTTTCGAAAGGAAGATGCAA-3′ and 5′-CCCTCCAAGAAATCTTCTGC-3′. Primer sequences for β-actin were: 5′-GGCATCGTGATGGACTCCG-3′ and 5′-GCTGGAAGGTGGACAGCGA-3′. We compared the level of Vps37A protein expression in blood lymphocytes and skin fibroblasts from affected individuals and healthy control fibroblasts (Cascade Biologics, Portland, Oregon, USA). Actin was used as a protein loading control. Since Vps37A interacts with other ESCRT-I proteins, such as Vps28 and Tsg101/vps23,6 we investigated whether Vps37A(K382N) is capable of interacting with members of the ESCRT-I protein complex. Protein extracts were made from control (Cascade Biologics) and mutant fibroblasts. Wild type and patient fibroblasts were washed with PBS and lysed with 1% Nonidet P40, 50 mM TRIS pH 8, 150 mM NaCl, and a protease inhibitor mix (Roche Diagnostics, Indianapolis, Indiana, USA). Rabbit polyclonal Vps37A (Proteintech Group Inc, Chicago, Illinois, USA) was coupled to M-280 magnetic dynabeads (Invitrogen, Life Technologies, Carlsbad, California, USA) and a coimmunoprecipitation assay followed by western blotting was performed. Equivalent amounts of total protein cell extracts, as determined by BCA assay (Pierce Biotechnology, Rockford, Illinois, USA), were mixed with the Vps37A coupled dynabeads, or dynabeads only (negative control), and incubated overnight at 4°C in lysis buffer. The beads were boiled in Laemmli buffer (Biorad, Hercules, California, USA) and eluates were loaded onto a 4%–12% tris-glycine gel (Invitrogen, Life Technologies, Carlsbad, California, USA). Equivalent amounts of total protein, as determined by BCA assay (Pierce Biotechnology), from fibroblasts, lymphocytes or IP assays were loaded onto 4%–12% tris-glycine gels. After blotting, the nitrocellulose membranes (Invitrogen, Life Technologies, Carlsbad, California, USA) were probed with primary antibodies against Vps37A, Tsg101 and Vps28. HRP-labelled antimouse antibody or antirabbit antibody (Amersham Biosciences, Piscataway, New Jersey, USA) was used as a secondary antibody. The antigen–antibody complexes were detected with an ECL kit (Amersham Biosciences). Antibodies used for western blotting were: rabbit polyclonal anti-Vps37 (Proteintech Group Inc Novus Biologicals, Littleton, Colorado, USA), Tsg101 and Vps28 (Santa Cruz Biotechnology Inc, Santa Cruz, California, USA). 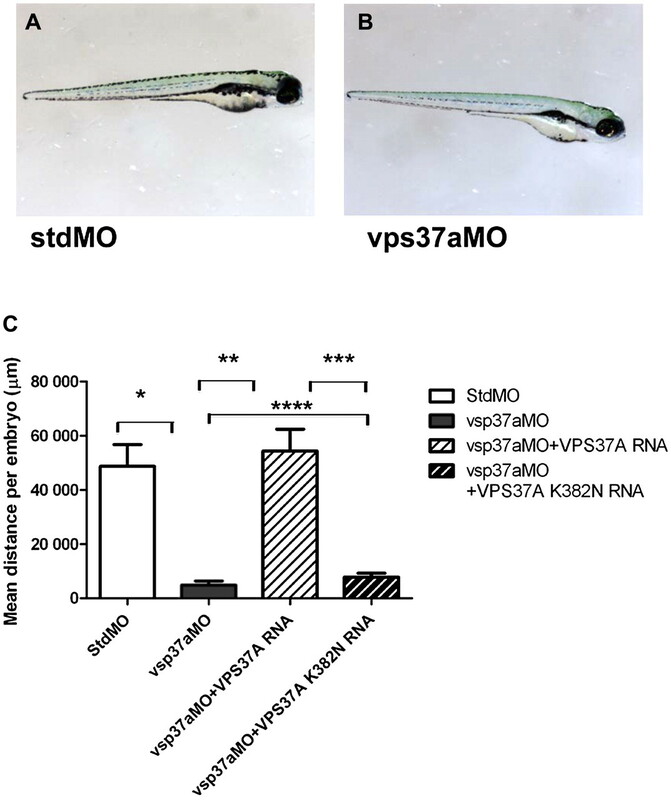 To investigate the in vivo function of Vps37A in vertebrates and to further establish the causative relationship between Vps37A and the CHSP phenotype, we created a vps37a knockdown morpholino oligonucleotide (MO) zebra fish. Wild type zebrafish (AB x Tup LF) were staged and housed as previously described.14 Groups of 25–30 stage-matched embryos were collected at 96 h postfertilisation (hpf). For vps37a knockdown, antisense MO (GeneTools, Philomath, Oregon, USA) were designed against the vps37a gene (Accession number: NM 001145152), 25 base pairs upstream of transcript start codon (vps37a 5′ATG: 5′-GTCTGTATGAGTTACTGCCGGACAT-3′) and the intron 1-exon 2 splice site (vps37a Spl: 5′-CTCTGGTTTTCACTGCACAAGAAAA-3′). Embryos were injected with MO (1 ng/embryo) at the 1- to 2-cell stage and allowed to develop at 28.5°C to desired stages. To evaluate functional consequences of Vps37A knockdown, and to detect reduced larval mobility, we applied a touch response test at 96 hpf as published previously.15 For rescue experiments, full length human VSP37A was amplified by PCR from a human cDNA clone (IMAGE clone: 5275060, Accession: BI550733.1, Open Biosystems) and cloned into pCS2+ (Invitrogen, Life Technologies, Carlsbad, California, USA). Mutagenesis was undertaken using the QuickChange site directed mutagenesis kit (Stratagene, Agilent Technologies, Santa Clara, California, USA) according to the manufacturer's instructions. The missense mutation was introduced for VSP37AK382N using the primer sets (Forward: 5′-gagccaaggaagagaatcttcagcaggcgatag-3′; Reverse: 5′-ctatcgcctgctgaagattctcttccttggctc-3′). VSP37A plasmids were linearised with Not1 and mRNA synthesised using Ambion mMessage mMachine SP6 kit. Either wild type or mutagenised mRNA (75 pg) were injected into the cytosol of one cell stage embryos with vsp37a MO. Medical history and physical examinations of seven individuals from one kindred (figure 1A) and two from a second (figure 1B) revealed common features (table 1), including normal pregnancy and delivery, developmental and motor delay from the first or second year of life, followed by unsteadiness in standing, and difficulties in walking. All affected children presented with spasticity in the lower limbs that progressed to the upper extremities, requiring recurrent physiotherapy and ligament lengthening operations. Several patients were treated with botulinum injections with moderate improvement, regaining the ability to walk with the aid of a walker. All patients presented mild to moderate delays in cognition and speech. Marked kyphosis was noted in all patients. However, patients II8 and III12, from kindred 2 (figure 1B), presented a more severe phenotype (table 1). When assessed, laboratory test results, metabolic measurements, EEG, EMG, muscle biopsy and oxidative phosphorylation studies were normal (data not shown). Patients were not dysmorphic. Brain and spinal cord MRIs were essentially normal with non-specific findings in some patients. Seven additional members (IV17, V9-14, figure 1A) of the first kindred and one additional of the second (II9, figure 1B) were suspected of being affected with an identical phenotype, but were not available for examination or genetic analysis. Pedigrees of kindreds 1 (A) and 2 (B) showing haplotypes across the complex hereditary spastic paraparesis linked locus. Ten microsatellite markers spanning 6.8 cM on chromosome 8 were used for haplotype reconstruction. Roman capitals indicate generations. The code numbers of all family members appear below symbols. Filled symbols indicate affected members. Black dots indicate obligate carriers. Circles, female subjects; squares, male subjects; slant, deceased. The haplotype assumed to carry the disease allele is framed in square. The healthy consanguineous parents of all affected individuals in the first kindred are descended from a single ancestor, indicating autosomal recessive inheritance and suggesting a founder mutation. The pedigree of the second kindred is also consistent with autosomal recessive inheritance. Genome-wide screening of nine members of kindred 1 (figure 1A), followed by fine mapping using 30 additional DNA samples from members of this kindred, supported sole linkage to a 12 Mb (25 cM) region spanning markers D8S550 to D8S1734, with a maximum LOD score of 6.7, on marker D8S261 (table 2). Linkage to all other chromosomal regions was excluded by negative LOD scores. Haplotype reconstruction for kindred 1 revealed a uniform homozygote region shared by all affected members, and cosegregating with the disease, flanked by markers D8S261 and D8S405. Detection of the identical homozygous region between markers D8S280 and D8S405 in healthy individual VI-18 narrowed the CHSP locus to the region between markers D8S254 and D8S280, an interval of 3.8Mb (6.8 cM, position according to the March 2006 release of the human genome assembly, hg18) (figure 1A). Haplotype reconstruction of kindred 2 using a slightly different repertoire of markers within the same linked region, dictated by informatively of DNA markers, revealed a common haplotype cosegregating with the disease in affected individual II8 (figure 1B). However, affected individual III12 inherited the disease linked allele from her father, and a slightly different allele from her mother (figure 1B), possibly due to expansion of the repeat number in marker D8S261 that occurred in one of the founders of this family. The common genomic segment encompasses 24 genes and predicted transcripts (supplementary table 1). The relevance of these genes to HSP was assessed according to the criteria detailed in the Methods section. Out of the 24, eight genes were defined as good candidates to have the disease-causing mutation: FGF20, NAT1, PSD3, LPL, SLC18A1, ATP6V1B2, LZTS1 and VPS37A. All eight candidate genes were sequenced, and 16 polymorphisms were found. Out of these, 15 were previously reported SNPs with no link to the pathology. VPS37A c.1146A>T was the only novel sequence variant found. We identified a novel A>T point substitution in Vps37A (OMIM 609927), in the coding region of exon 11, rendering a lysine to aspargine inframe substitution at position 382-p.K382N (figure 2A). Cross-species alignment of the amino acid sequences for Vps37A showed lysine in position 382 to be highly conserved throughout evolution (figure 2B,C). (A) Genomic DNA sequence analysis of Vps37A reveals a homozygous A>T transition at position c.1146 (indicated by arrow) in exon 11, resulting in a lysine to asparagine substitution at position 382 of the Vps37A protein (p.K382N). The samples: wild type: unrelated control; healthy heterozygote: kindred 2, II10; affected homozygote: kindred 2, III12. (B) ConSeq results for PFAM multiple alignment of mod(r) domain demonstrate that within this conserved domain, the mutated lysine (marked by red square) is highly conserved, and predicted to be solvent exposed and to have a functional role. (C) Evolutionary conservation of the Vps37A C-terminal part. NCBI-blastp protein sequence alignment of the Vps37A C-terminal encompassing the mutation site reveals high conservation of lysine at position 382 (in red) among various species. No SNP in this location was previously reported in the 1000 genomes project or NCBI's dbSNP. Analysis of the impact of the mutation on protein function was predicted to be deleterious using Polyphen (‘Probably Damaging’ with a score of 1.000) and Panther (‘Deleterious’ with 88.4% probability), while SIFT tool predicted the mutation to be ‘Tolerated’ with a score of 0.22. PredictProtein analysis of the normal and mutant proteins gave similar results with no indication of change. Lysine 382 is located at the C' terminus of the protein, in an unstructured region. Analysis of the tertiary structure predicted that no structural change would be caused by the substitution. Prediction of the impact of the mutation on the protein stability, using the MUpro tool, was inconclusive, with some of the methods used showing increased stabilisation while others showing it to decrease. Previously published causative mutations for HSP in Palestinians, in exon 8 and 13 of the KIF1A gene,12 ,13 were examined and ruled out. Using direct sequencing and restriction analysis we showed complete segregation and thus full penetrance of the mutation Vps37A c.1146A>T with the disease phenotype; all affected individuals were found homozygous to the change, obligate carriers and some siblings of the affected were heterozygous, and no healthy members of kindreds 1 and 2 were homozygotes. The absence of the identified point substitution in 428 chromosomes of healthy ethnically matched control samples refuted the possibility of a unique ethnic polymorphism. Interestingly, random analysis of DNA samples from 50 healthy individuals, residents of the same village, but not related to our patients, revealed three carriers for the point substitution, none of them homozygous, pointing indeed towards a founder mutation in this genetic isolate. Vps37A mRNA transcript (Human Multiple Tissue cDNA Panel, BD Biosciences) was observed in the eight normal tissue types examined: heart, brain, placenta, lung, liver, skeletal muscle, kidney, and pancreas, with lower levels in the brain and skeletal muscle (figure 3A). Expression levels of Vps37A mRNA derived from lymphocytes and fibroblasts of affected individuals were found equivalent to those of healthy individuals (figure 3B). (A) Expression of Vps37A in multiple tissue samples. Human adult multiple tissue cDNA panel was amplified with the sequences at coding regions of Vps37A and G3PDH as primers. Vps37A was expressed in all human adult tissues tested. It was expressed at a high level in pancreas, placenta and heart, and at a lower level in skeletal muscle and brain (semiquantitative). (B) Vps37A expression in healthy and affected lymphocytes and fibroblasts. cDNA from fibroblasts and lymphocytes was extracted using RT-PCR, and amplified by multiplex PCR using Vps37A and β-actin primers. Repeated experiments demonstrated similar Vps37A expression in both tissues. (C) Endogenous expression of Vps37A in control and complex hereditary spastic paraparesis (CHSP) cells. Western blots of lysates from fibroblasts and lymphocytes. Western blot of protein extracts from control (lanes 2 and 4) and CHSP cells (lanes 1 and 3) stained with anti-Vps37A and anti-actin (protein loading control). Both control and CHSP cells expressed comparable amounts of Vps37A protein. (D) Interaction of Vps37A with members of the ESCRT-I complex. Co-IP with an anti-Vps37A antibody on protein extracts from control (lane 1) and CHSP (lane 2) fibroblasts. Western blot was probed for Vps37A, Vps28 and Tsg101. Both Vps37A (wild type) and Vps37A (K382N) showed interaction with Vps28 and Tsg101 (lanes 1 and 2). The negative control, beads only co-IP on protein lysates of wild type (lane 3) and mutant (lane 4) fibroblasts did not show binding with Vps37A, Vps28 or Tsg101. 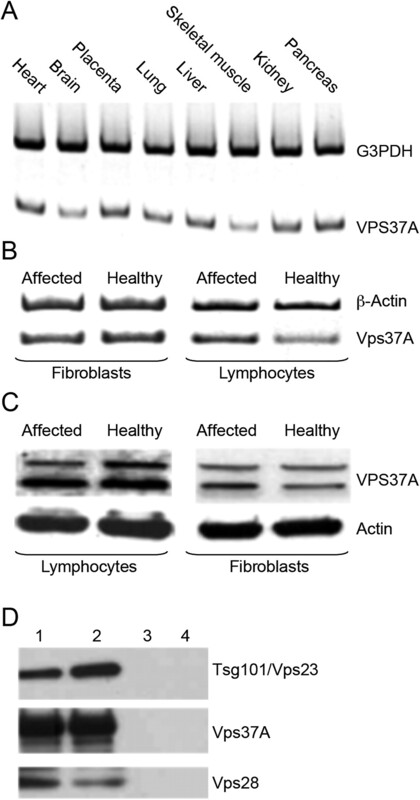 Equal amounts of protein lysates, as determined by BCA assay from both affected and control fibroblasts and lymphocytes, showed equivalent amounts of Vps37A protein on western blot probed with a Vps37A-specific antibody (Santa Cruz Biotechnology) (figure 3C), indicating that the novel missense mutation does not cause destabilisation of the Vps37A protein. We found that both Vps28 and Tsg101 coimmunoprecipitated with Vps37A (wild type) and Vps37A (K382N) in equal amounts (figure 3D, lanes 1 and 2). The beads-only co-IP, which served as a negative control, did not show a specific immunoprecipitation with the Vps37A, Vps28 or Tsg101 protein (figure 3D, lanes 3 and 4). Zebrafish embryos injected with 1 ng of vps37a MO showed no obvious dysmorphology at 96 hpf (figure 4A,B). The Vps37A MO-injected zebrafish at 96 hpf showed striking and significant loss of motility in comparison with standard MO-injected controls (figure 4C), providing evidence for Vps37A involvement in CHSP. Rescue with wild type but not with mutated VPS37A proved specificity of this morpholino approach (figure 4C). Zebrafish model for Vps37A complex hereditary spastic paraparesis; zebrafish embryos were injected at the one-cell stage with either 1 ng of standard morpholino (stdMO) (A) or 1 ng of splice site MO (vps37aMO) (B) and showed no obvious defects in gross morphology analysed at 96 h postfertilisation (hpf). (C) Embryos injected with control MO (n=23), Vps37A MO (n=23), vps37a MO plus VPS37A RNA (n=26) or vps37a MO plus VPS37A RNA with mutation K382N (n=25) were subjected to a touch response test to determine the degree of larval mobility. At 96 hpf, the mean distance per embryo was significantly reduced in Vps37A MO-injected and embryos. Graph showing the mean distance per embryo (μm) in the touch response test: controls (StdMO) (48667±8045, n=23), vps37aMO (4889±1453, n=23), vps37aMO+VPS37A RNA (54278±8094, n=26), vps37aMO+VPS37A K382N RNA (7833±1424, n=25). Values shown as mean ± SEM. Data were analysed using the Mann–Whitney U test. *p<0.0001, **p<0.0001, ***p<0.0001, ****p=0.0374 (NS). Vps37A encodes a subunit of the ESCRT-I complex. The lysine in position 382 is highly conserved throughout evolution, appearing in all examined organisms. The impact of the mutation on protein function was predicted to be deleterious using Polyphen and Panther, while SIFT tool predicted the mutation to be ‘Tolerated’. PredictProtein analysis of the normal and mutant proteins gave similar results with no indication of change. Analysis of the tertiary structure of VPS37A predicted that no structural change would be caused by the substitution, and we show that mutant Vps37A protein expression does not destabilise the ESCRT-I complex. The observation that Vps37A (p.K382N) is still able to interact with members of the ESCRT-I complex Vps28 and Tsg101 suggests that the conserved K382 is not involved in ESCRT-I assembly, but rather affects normal muscle tone and strength via a different biological pathway. Thus, this position may be related to interactions with other proteins or other forms of regulation of the protein which are currently unknown. The current study shows for the first time the involvement of the ESCRT-I member, Vps37A, in CHSP. Spastin, atlastin, REEP1 and spartin are other proteins involved in ESCRT complexes that are encoded by HSP causative genes.31–39 Other defects in membrane trafficking have also been associated with HSP. Infantile-onset ascending hereditary spastic paralysis16 and ALS219 are two recently documented examples. Furthermore, we note that defects in ESCRT compounds have been implicated with neurodegenerative diseases other than HSP, such as frontotemporal dementia and amyotrophic lateral sclerosis.29 ,40 The current findings enable accurate genetic counselling to patients and their families, carrier testing and early prenatal diagnosis in a large consanguineous population in northern Israel, and possibly in other CHSP families worldwide. The molecular mechanisms underlying the phenotype are not yet known, but are possibly related to vesicular trafficking or abnormal ubiquitination. We thank the patients and their parents for participating in this study, and the nurses from the prenatal and postnatal clinics of the village for their assistance with its realisation. We thank Julia Fekecs (NHGRI, NIH, Bethesda, Maryland, USA) for assisting with the preparation of the figures. The authors are most thankful to Dr Sara Amit, former head of the neuro-developmental department in the Western Galilee Hospital, who first took care of the patients described in this report, initiated and supported this project, but unfortunately did not live to see its successful completion.
. Beiträge zur Pathologia des Rückenmarks. Arch Psychiatr Nervenkrankheiten 1880;10:676–717.
. Hereditary spastic paraplegia Overview. In: Pagon RA, Bird TD, Dolan CR, et al., eds. Gene Reviews. University of Washington, Seattle (WA), 1993.
. Complicated autosomal recessive hereditary spastic paraplegia: a complex picture is emerging. Neurology 2008;70:1375–6.
. Hereditary spastic paraplegias. In: Scriver C, et al., eds, Metabolic and Molecular Bases of Inherited Disease. OMMBID. New York: McGraw-Hill, 2010.
. Clinical heterogeneity of autosomal recessive spastic paraplegias: analysis of 106 patients in 46 families. Arch Neurol 1999;56:943–9.
. Membrane budding. Cell 2010;143:875–87.
. The hereditary spastic paraplegia protein spastin interacts with the ESCRT-III complex-associated endosomal protein CHMP1B. Hum Mol Genet 2005;14:19–38.
. SPG20 protein spartin is recruited to midbodies by ESCRT-III protein Ist1 and participates in cytokinesis. Mol biology cell 2010;21(19):3293–303.
. Neuronal functions of ESCRTs. Exp Neurobiol 2012;21:9–15.
. Mammary-digital-nail (MDN) syndrome: a novel phenotype maps to human chromosome 22q12.3-13.1. Eur J Hum Genet 2010;18:662–7.
. Online system for faster multipoint linkage analysis via parallel execution on thousands of personal computers. 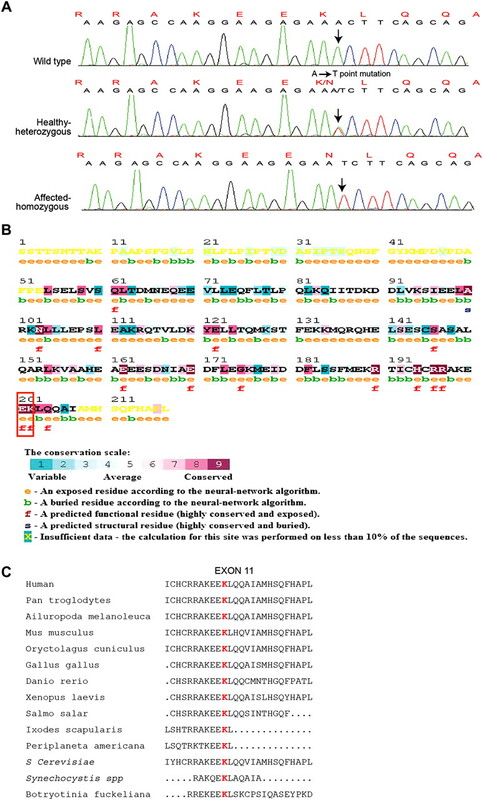 Am J Hum Genet 2006;78:922–35.
. Exome sequencing and disease-network analysis of a single family implicate a mutation in KIF1A in hereditary spastic paraparesis. Genome Res 2011;21:658–64.
. KIF1A missense mutations in SPG30, an autosomal recessive spastic paraplegia: distinct phenotypes according to the nature of the mutations. Eur J Hum Genet 2012;20:645–9.
. Identified motoneurons and their innervation of axial muscles in the zebrafish. J Neurosci 1986;6:2267–77.
. Zebrafish atlastin controls motility and spinal motor axon architecture via inhibition of the BMP pathway. Nat Neurosci 2010;13:1380–7.
. Infantile-onset ascending hereditary spastic paralysis is associated with mutations in the alsin gene. Am J Hum Genet 2002;71:518–27.
. Population screening in a Druze community: the challenge and the reward. Genet Med 2008;10:903–9.
. A broad spectrum of developmental delay in a large cohort of prolidase deficiency patients demonstrates marked interfamilial and intrafamilial phenotypic variability. Am J Med Genet B Neuropsychiatr Genet 2010;153B:46–56.
. Loss of ALS2/Alsin exacerbates motor dysfunction in a SOD1-expressing mouse ALS model by disturbing endolysosomal trafficking. PloS One 2010;5:e9805.
. The growth-regulatory protein HCRP1/hVps37A is a subunit of mammalian ESCRT-I and mediates receptor down-regulation. Mol Biol Cell 2004;15:4337–46.
. The human endosomal sorting complex required for transport (ESCRT-I) and its role in HIV-1 budding. J Biol Chem 2004;279:36059–71.
. ESCRT-I function is required for Tyrp1 transport from early endosomes to the melanosome limiting membrane. Traffic 2009;10:1318–36.
. p53 accumulation, defective cell proliferation, and early embryonic lethality in mice lacking tsg101. Proc Natl Acad Sci U S A 2001;98:1859–64.
. Tsg101: a novel tumor susceptibility gene isolated by controlled homozygous functional knockout of allelic loci in mammalian cells. Cell 1996;85:319–29.
. Abnormal regulation of TSG101 in mice with spongiform neurodegeneration. Biochim Biophys Acta 2009;1792:1027–35.
. HCRP1, a novel gene that is downregulated in hepatocellular carcinoma, encodes a growth-inhibitory protein. Biochem Biophys Res Commun 2003;311:1057–66.
. Polyubiquitin chains: polymeric protein signals. Curr Opin Chem Biol 2004;8:610–16.
. The tale of protein lysine acetylation in the cytoplasm. J Biomed Biotechnol 2011;2011:970382.
. The ESCRT machinery in endosomal sorting of ubiquitylated membrane proteins. Nature 2009;458:445–52.
. ESCRTs and human disease. Biochem Soc Trans 2009;37:167–72.
. Troyer syndrome protein spartin is mono-ubiquitinated and functions in EGF receptor trafficking. Mol Biol Cell 2007;18:1683–92.
. The identification of a conserved domain in both spartin and spastin, mutated in hereditary spastic paraplegia. Genomics 2003;81:437–41.
. Spastin couples microtubule severing to membrane traffic in completion of cytokinesis and secretion. Traffic 2009;10:42–56.
. Interaction of two hereditary spastic paraplegia gene products, spastin and atlastin, suggests a common pathway for axonal maintenance. Proc Natl Acad Sci U S A 2006;103:10666–71.
. Spectrum of SPG4 mutations in autosomal dominant spastic paraplegia. Hum Mol Genet 2000;9:637–44.
. Hereditary spastic paraplegia proteins REEP1, spastin, and atlastin-1 coordinate microtubule interactions with the tubular ER network. J Clin Invest 2010;120:1097–110.
. SPG20 is mutated in Troyer syndrome, an hereditary spastic paraplegia. Nat Genet 2002;31:347–8.
. Spastin and atlastin, two proteins mutated in autosomal-dominant hereditary spastic paraplegia, are binding partners. Hum Mol Genet 2006;15:307–18.
. Structural basis for midbody targeting of spastin by the ESCRT-III protein CHMP1B. Nat Struct Mol Biol 2008;15:1278–86.
. ESCRTs and Fab1 regulate distinct steps of autophagy. Curr Biol 2007;17:1817–25. Funding This work was supported by the Rappaport Institute for Research Haifa to TCFZ, Israel; Microsoft Inc 2009331 to TCFZ; and the Intramural Research Program of the National Human Genome Research Institute, National Institute of Health, Z99HG999999 to WW. Patient consent All study participants and parents of minors signed locally approved and appropriate informed consent forms, delivered by board certified geneticists/genetic counselors able to communicate in the patients' local language, following local and international Helsinki committees' directives. The anonymity of patients is kept. Ethics approval The ethics approval was provided by the Ethics committee of Western Galilee Hospital, Nahariya, Israel and by the supreme Ethics committee of the Israeli Ministry of Health.